I was in sixth grade when this next incident occurred. If any part of this story seems like boasting, rest assured that is not my intention. I feel it is necessary to state the facts in a clinical sense, so the reader can better put this episode in context. 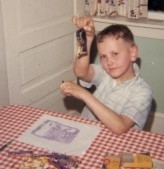 When I was a little boy, I could always read and write (and spell) at a level far beyond my tender years. When I was four, my older brothers, Steve and George, would bring home comic books from Matthew’s News agency (formerly Houseman’s) and, when they weren’t around, I would sneak the copies of SGT. FURY, SPIDERMAN, THE FANTASTIC FOUR and others downstairs and try to read them. The best I could do was to follow the stories by the pictures. But in Kindergarten, I learned the alphabet. In first grade, I learned to read. That is when I became a dangerous man. While my class-mates slogged through Alice and Jerry primers (See Jip run. Run, run, run…. ), I was reading three newspapers a day, cover to cover. The Woodbury Times, The Philadelphia Inquirer, and The Philadelphia Daily News. Sam Pinnizzotto, my sister Donnis’ then boyfriend (now her husband), can verify this. He couldn’t believe it when he would come over and see me on the living room floor, that day’s papers spread out before this six-year-old boy, as I read all of them. I soon also began to write my own stories. Usually “inspired” by the superhero and monster comics I was reading. Often, I would illustrate these, sitting at my little corner of the kitchen table and drawing for hours on cardboard my brother Wayne would bring me home from work. I would go through stacks of paper, and packs of black and blue BIC pens. From reading and writing so much, I naturally became a great speller. And all this seemingly awful braggadocio brings us to our story. Because I was considered such a prodigy, no one was surprised when I would win virtually every spelling bee we ever had in our class. This went on all through grade school. Acing every spelling test. Winning every spelling bee. My talent with the English language had never failed me. Indeed, never would. Until one dark, terrible day when I needed it most. The famous Scripps Howard spelling bee was a major event each year. Fourth through eighth grade students from all across the country would compete in Washington, DC, the grand prize the princely sum of one thousand dollars cash. And this year, Billingsport Elementary was in the competition. First, there would be a written test given to each class. The student with the highest score would then compete for the school championship. The school champion would then continue through each level of competition regionally, until they finally faced off against the brightest and the best in the nation in Washington, DC. There, they would battle it out in front of hundreds of spectators for the big one thousand dollar prize. To put it in perspective, a candy bar cost a kid a nickel in 1971, the year I was in sixth grade. Horror and monster comics cost thirty-five cents. Sodas were about twenty-five cents a bottle. Since I would spend the prize-money on nothing but those three items, I was delirious with the possibilities. I had to win that spelling bee. No matter what. The day of the written test I was nervous. Confident, but nervous. Mr. Banks’ class had a lot of sharp kids that year. There were many prodigy types in my class. Kathy Vaczi, Nancy Will, Edward Bowman, Charles Henry, Wayne Scierocinski. And Mike Keresztury in the other sixth grade class. He was a real brain. Any one of these bums might steal my prize from me. I could not let that happen. Mr. Banks read the words aloud, and we had to write the correct spelling. There were one hundred and twenty-five words. When the test was over, we all graded our own papers, as the teacher gave the correct spellings. Trouble began almost immediately as I started finding words misspelled on my paper. How could this be? First one, then five, then ten, then twelve, fourteen, and, finally, fifteen. How could this be? I had missed fifteen out of one hundred and twenty-five words on the stupid test. I could see all those horror comics, Milky Way bars, and green glass bottles of Coke flying out the sixth grade classroom window. One thousand dollars worth of them. I could not let this happen. No way in the world would Kathy Vaczi misspell that many words. Or Edward Bowman. None of those sharp kids would miss anywhere NEAR that many. To this day I am ashamed of what I did next. But at the time, I felt I had to. There would be my Mom and Dad and family to face when I got home. There would be no glory for second best. I took my yellow no. 2 pencil, and, with the pink stub of an eraser on the end, I corrected my errors. I think I turned it in with two wrong. Unless one of the other little geniuses maxed the thing, I was class champion. If I had to lie and cheat to get there, so be it. When the scores were all in, I discovered that the next highest scorer had misspelled twenty-seven words! That meant even if I hadn’t cheated, I would still have been class champion, with only fifteen words misspelled! My victory seemed strangely empty and hollow somehow. Finally the day of the school championship arrived. I would be competing against the other sixth grade champ, and two fourth and fifth grade champions. The contest was held in Miss Ireland’s classroom. She was the fifth grade teacher. She would say the word, then we had to repeat it, then spell it. The only other competitor I recall was little Kathy DuBois, the fourth grade champion. (The DuBois’ lived across the street from us.) I remember her because her treachery is what did me in. I held my own for the first several rounds, slamming back each correctly spelled word the way a tennis pro might swat the ball back across the net in an easy match. Then, seemingly out of nowhere, disaster struck. I was given the word BALLOON. No problem. 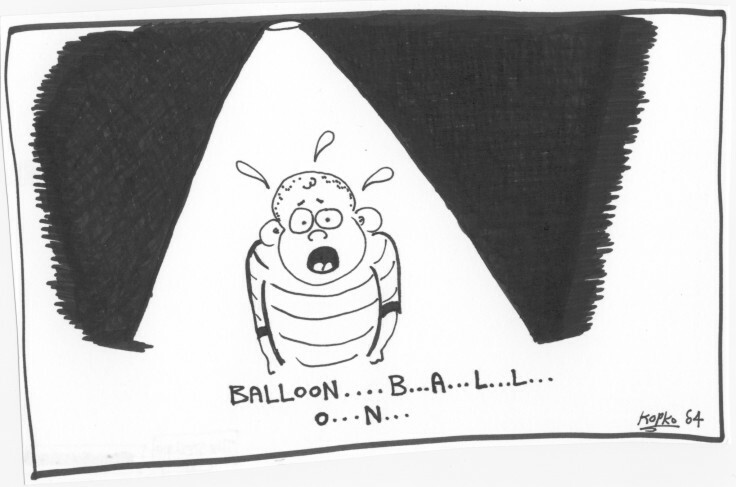 BALLOON….B..A..L..L..O..O..N, I said. An easy one. To my shocked dismay, Miss Ireland said she was sorry, but the correct spelling was B..A..L..L..O..O..N.
On the verge of panic I blurted out that that was how I HAD spelled it. She told me I had only said one O. No, I protested, I definitely said two O’s! She turned to little fourth grade champion Kathy DuBois (my competitor!) and asked HER if I had said one O or two. Now I appeal to you, the reader….Is it fair that this teacher (who held my future, my very LIFE…and one thousand of my dollars in her hands) consulted with A STUDENT WHO WAS COMPETING WITH ME? No! Of course not! Who would even THINK such a thing?! I looked desperately to this little neighbor girl, who was now in a position to put me on my way to a fortune, or send me home in defeat and disgrace. Come on, Kathy…..Tell her. You heard me say two O’s……You heard me……Tell her you ….. I wanted to scream. They couldn’t DO this to me. Not on BALLOON! A FOUR-year-old could spell balloon. My b..a..l..l..o..o..n must have sounded like b..a..l..l..o..n.
I was finished. Out of the game. A loser. My dreams shattered, I got up from the chair in a daze. Mr. Banks’ admonition to “bring home the pride” rang in my head as I shuffled out the door and went home. It was the longest walk of my life. Possibly a Justice that would not be denied was at work making sure I did not win. For cheating on the written test to become class champion, I should have been disqualified. Indeed, I would have been had I been caught. No one from our school got any further than the regional contest. For some reason, our school did not compete when I was in seventh or eighth grade. My one chance to grab the brass ring, gone in a moment’s time. I often wonder how I would have done, but for divine justice intervening (and my sinus-caused speech impediment). Then she would laugh that laugh of hers, as though she had just said the funniest thing in the whole world.